Barnt Green author Steve Dunn has, for his sixth book on WW1 naval history, chosen to concentrate on a specific theatre of the war and the somewhat divisive figure at its centre. As in his previous work, this account is packed with an astonishing level of detail, which brings Vice Admiral Lewis Bayly vividly to life despite the man’s inscrutable nature making it difficult to do so. Bayly was in charge of the Coast of Ireland Command, with responsibility for protecting the merchant shipping that was so vital in keeping Britain fed and armed during the war, hopefully sinking a few U-boats along the way. The book tells how this role – for which he was not an obvious choice – was hampered not only by enemy subs and mines, but also by the navy’s lack of resources, the unrest in Ireland, and the good old British weather. As the story unfolds, we learn how Bayly threw himself into the challenge, using every vessel he could get his hands on and becoming an early adopter of “Q-ships”, which sailed under false colours so as to sneak up on the enemy. His success is judged not so much by victory in the Western Approaches (where there was huge loss of Allied life) but by becoming a respected leader of men. Although he had “a mania for efficiency and discipline” and was considered “more than a little mad”, this quintessential stiff-upper-lipped Englishman took a hands-on approach and cared deeply for the men under his command. In particular, he was loved by the American sailors who, when their country finally joined the war, also found themselves and their ships under his control. Aside from Bayly, the book contains a huge cast of supporting characters, but Dunn manages to add snippets of information on each of them. There are also some entertaining anecdotes – such as the U-boat commander who gave Christmas gifts to his Allied prisoners; and the rescue trawler that mistook a life raft for a German sub and was only deterred from firing when the survivors launched into a chorus of Tipperary. Dunn also includes plenty of political background to further the reader’s understanding of the situation, including the 1916 Easter Rising whose relevance to the “main” war is often overlooked. The author admits that he began the book with a dislike for Bayly – who, among other things, had been blamed (by Churchill, who else?) for the Formidable disaster in 1915 – but came to admire his “fundamental decency”, and Bayly’s War pays tribute to the man as well as to the quiet sacrifice of the merchant sailors. 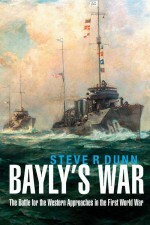 Bayly’s War is available from Seaforth Publishing, Amazon and good bookshops.